The Beast Build Log: The Beast lives! Been a little while since updating, but there's been a lot of work done. After talking with several people I decided not to bother with changing out that damaged piece of the 4x4 hub. I regreased the old parts and reinstalled those, finishing up the hubs. I was so excited :) Sure that it wouldn't take long to bleed the brakes and get the truck rolling, my buddy Louis came over and we started working on them. Fluid didn't seem to be passing from the master cylinder into the brakes. They had been hanging disconnected with the lines empty for a while, so Louis got out a vacuum pump and started trying to pull fluid through that way. It still wasn't working. Louis said that the master cylinder piston(s) may have gotten stuck from the lines being empty or something, so we took the master cylinder off. 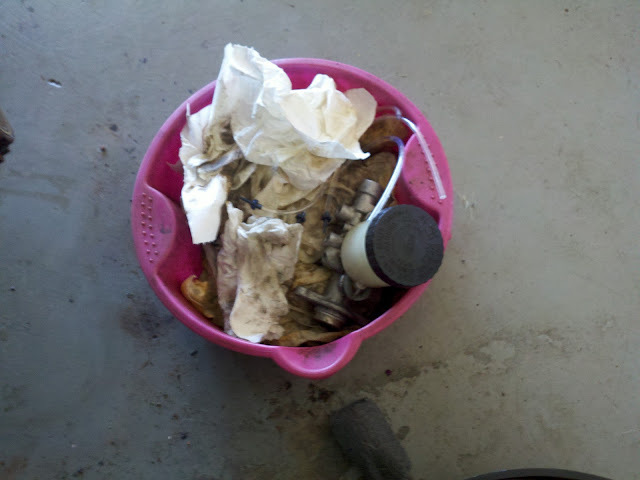 We cleaned the outside of the master cylinder and dumped the old cruddy fluid out. I bought some new brake fluid and some brake cleaner, so we took the master cylinder apart (couldn't get the rear piston out though) and cleaned everything real good, then tried to do a bench bleed. 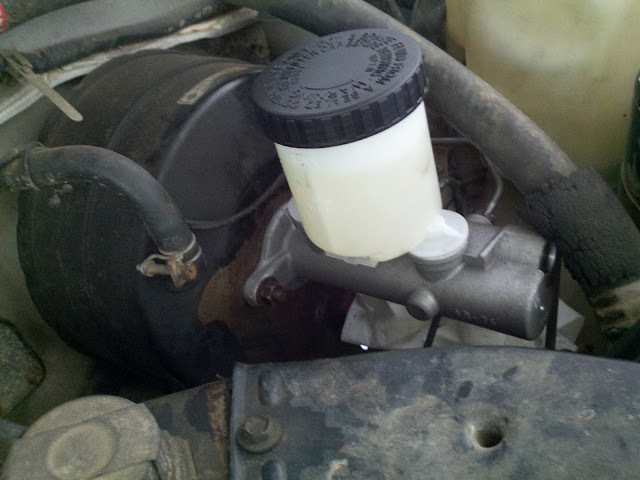 We weren't having much luck with that, so decided to just toss it on the truck and bleed it at the master cylinder. We still weren't getting fluid movement from the MC to the calipers though. Another day, another problem. Louis went home, defeated. I tried again later to get the MC working. Took it back apart and managed to get the front brakes moving fluid, but the rears wouldn't budge. Frustrated I got on ebay and bought a new one for $47 shipped. That arrived, I filled it with fluid, bled it, and installed. It looks really out of place being so clean and shiny, but I opened the bleeder valves on the calipers and let fluid drain down the lines, then bled it at the wheels and everything seemed fine. By the time I got everything ready to go and the wheels back on, it was pretty dark. I backed it out of the garage and drove it around the yard a little, breaking the new parts in. Steering felt great, but the brakes were a little squishy. Later we found that I hadn't tightened the MC bleeder valves enough. While dad was holding the brakes I tightened all those back up. Good news I guess, is that I got a good bleed out of it haha. Once that was tightened the brakes seemed fine. 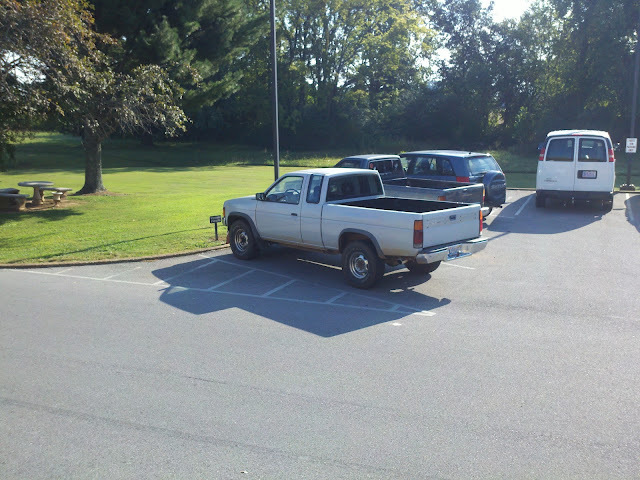 I parked it for the night to come back tomorrow. The next day dad and I got in the truck to drive it around the block. The alignment was awful. I didn't get it much over 25, but it was wearing hard on the tires. One lap around the block and I was done. The next day I had a local company tow it to the alignment shop. I didn't feel like trying to do an alignment, so for $65 they took care of it. After that, the truck was great! I've been driving it around for about 2 weeks now and love it! It drives so much better with the new steering parts. Feels like a different truck! Not having the brakes dragging means that it climbs hills and accelerates a lot quicker too. I really enjoy it. Since it sits outside, I installed a set of wheel locks to keep someone from jacking the wheels/tires. Also got a replacement rear center cap since it's been missing for a while. Installed that and retentioned the e-brake cable one evening. It's coming together! I still need to fix the headlight switch and finish the speaker install, but it's coming along! I updated the to-do list a few minutes ago to reflect the current status.